What’s it like to work for a Nazi, Eddie? The Rocketeer is a 1991 superhero movie put out by Disney, which makes it an amusing echo of our current era so dominated by Disney-distributed blockbusters of the Marvel persuasion. It’s even directed by the guy who made Captain America: The First Avenger. This, however, is not why it’s the most relevant movie of 2017. No, it’s because of the climax. The climax of The Rocketeer find our hero, Cliff Secord, in a stand-off with the bad guys in one of those scenes you find in pretty much every action movie: fedora-ed gangsters the Valentine gang and evil Hollywood star Neville Sinclair (a mustachioed Timothy Dalton) have the girl Cliff has been lusting after for the last 90 minutes or so (Jennifer Connelly) held hostage, and they’ll shoot her if he doesn’t give up the rocket-propelled jetpack that makes him The Rocketeer. This, also, is not why The Rocketeer is the most relevant movie of 2017. 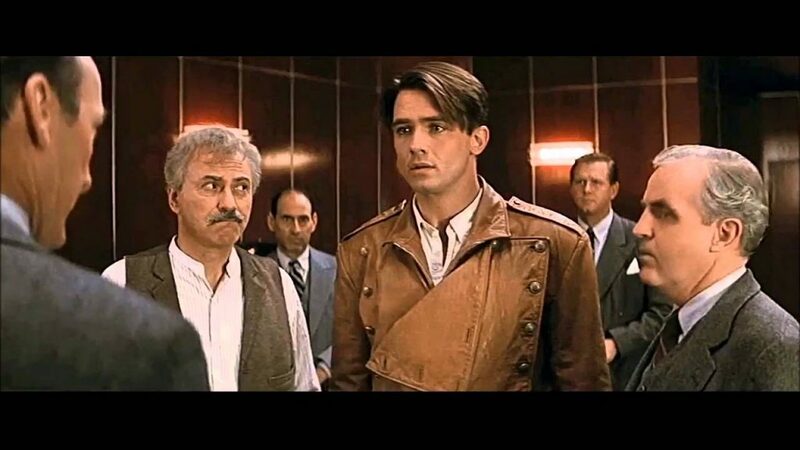 The Rocketeer is the most relevant movie of 2017 because Cliff asks the head gangster, Eddie Valentine, what it’s like to work for a Nazi. To back up a moment here, it’s 1938 and Cliff has spent the whole movie keeping this jetpack away from three groups of assholes. The first group is the Valentine gang, who stashed the jetpack at the airstrip where Cliff works because they (who all have New York accents and are named things like “Lenny”) were on the run from the second group of assholes who rightfully own the jetpack, the United States government. Cliff finds the rocket and, though the FBI very much would like it back, decides to use it for tricks so he can pay off the damages inflicted on the airstrip by the Valentine/FBI car chase of not so long ago. This puts him in the sights of not just the first two groups of assholes, but a third: Sinclair and his giant, disfigured henchman who wears an adorable little black hat and also literally folds people in half. Prior to the climax, Cliff is taken in by the FBI and, just before he makes an escape, learns that Sinclair is, in fact, a Nazi spy. The Rocketeer is the most relevant movie of 2017 because after Cliff asks his question to the head gangster here, Eddie turns to Sinclair and wants to know what the hell he’s talking about. And when Sinclair asks Eddie if it matters who he works for as long as the money’s good, Eddie pulls out his gun and says, “I may not make an honest buck, but I’m 100% American and I don’t work for no two-bit Nazi.” Timothy Dalton shouts something in iffy German, which prompts a good number of extras dressed up as Nazis to jump out of the bushes and a zeppelin to appear on the horizon. Eddie and his men drop their weapons. The Rocketeer is about togetherness. The Rocketeer is about people, no matter who they or where they’re from or what they do for living, uniting under the most noble banner there is: hating Nazis.